NEW YORK—Rob Astorino, the Republican candidate for New York governor, announced his first major policy proposal Monday focusing on corruption, a sore spot in Albany. In an interview with Epoch Times he also expounded on his main campaign focus—boosting the upstate economy. In a 10-point ethics proposal, Westchester County Executive Astorino called for term limits, a shorter legislative session, and other changes that he said will help combat a “democratic culture of corruption” in Albany. The state had more than 2,500 federal public corruption convictions over the last 35 years, the most in the country, according to a 2012 report from the University of Illinois. The plan includes a new ethics commission to investigate complaints against lawmakers, and a switch to cheaper legislative pensions. Astorino’s main message is that New York state has some of the highest taxes in the country, which alienate businesses. Cuomo addressed the problem by setting up tax free zones around university campuses across the state. But Astorino is not impressed, saying the zones only work for high-tech startups found eligible after a bureaucratic procedure. “Why are we picking and choosing winners?” he said. Cuomo said last year a 1 percent drop in income tax would cost $6 billion in state revenue, but solve nothing, since the competition, states like Florida or Texas, have no income tax. But New York may not need to go that far, according to Astorino. “We’re not going to get from fiftieth in the country to first overnight,” he said. Instead he suggested to first lower the taxes just enough to compete with other high-tax neighbors, like Vermont and Connecticut. “We should be the best of the worst, if you will,” he said. An ad campaign launched by GOP today accuses Cuomo of using a taxpayer-paid ad campaign to promote himself. The ads, which promote tax free zones, have cost some $15 million since January and don’t directly mention Cuomo. Astorino also criticized Cuomo for not showing any data on how many companies actually started up under the initiative. Astorino faces an uphill battle against Cuomo. A Siena College poll released Monday showed Cuomo with a 36 point lead over Astorino. The poll showed that while 63 percent of voters have a favorable view of Cuomo, 69 percent of respondents have no opinion of Astorino. 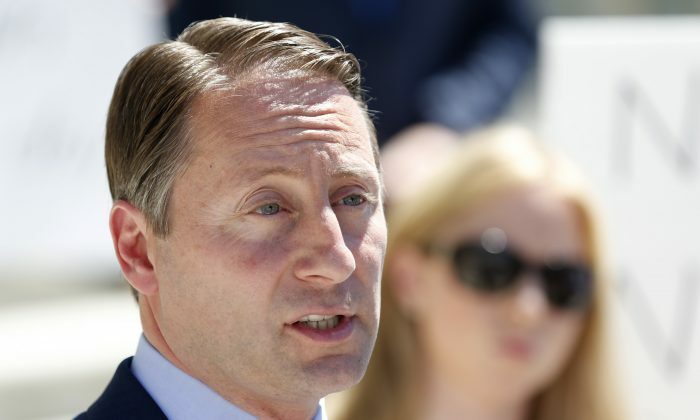 Astorino also picked an underdog position on several contentious issues. He supports fracking while opposing Cuomo’s gun-control act. On education, he stands for the abolition of Common Core learning standards. Moreover, the majority of New Yorkers don’t identify themselves with the Republican Party and the poll even showed that 45 percent of Republican voters favor Cuomo.